Hello gorgeous ladies! 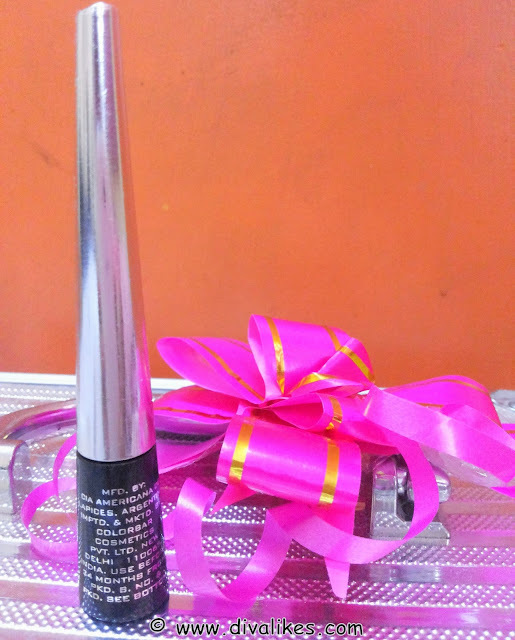 I am quite excited to write my second review about an eyeliner which will flatter your pretty eyes perfectly. I think eyes are the most expressive assets of a woman. If flaunt anything, be it my eyes! I firmly believe in that statement. Eye makeup is my favorite part in cosmetics shopping and I choose it very carefully. This one eyeliner is special to me as it came in the trousseau from the groom's side. "Tatva" as they call it in Bengali wedding contained a whole range of Colorbar goodies. My best friend told me that my eyes twinkled when I saw the precious silver finish Colorbar makeup box with all the beautiful cosmetics in it. Now that I have used it, I can safely say it is one of my priced possessions. The Waterproof Liquid Eye Liner is long-lasting and does not smudge, crack, flake or peel. With its high definition flexible felt tip applicator, one stroke is enough to define a fine or thick line. 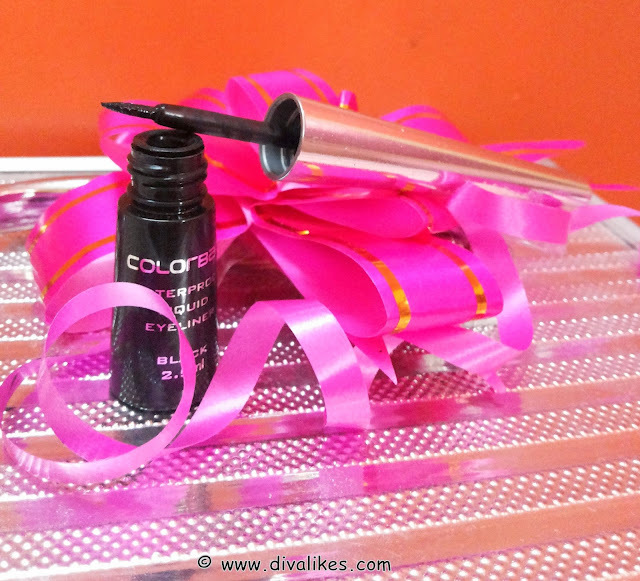 Fast drying, Waterproof Liquid Eye Liner is suitable for sensitive eyes and those who wear contact lenses too! Draw a fine line close to the lashes, from center of the eyes and sweep the applicator towards the outer corner of the eye leaving it in the free stroke. Repeat at inner corner sweeping towards the center to complete the line. 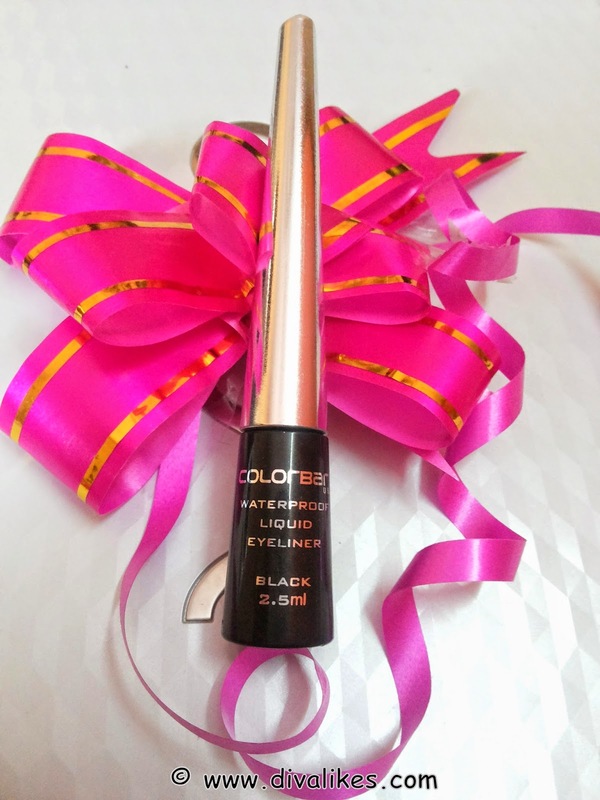 Colorbar Waterproof Liquid Eyeliner comes in a small black bottle with a long silver cap which has a thin but firm brush to give a perfect swipe each time. The length of the cap lets you hold it well, so that the swipe is not shaky on the eyes and glides smoothly on the skin. But the bottle is glass and it might break if not given proper attention. The shade of black is dark and intense and the eyeliner gives a rich matt finish. This eyeliner does not have a runny consistency and dries pretty fast. I have sensitive eyes and it does pretty good justice to them. It is actually water proof and smudge resistant. I never wear eyeliners to movies as one or the other scene makes me pretty emotional and I end up shedding a tear or two and start smudging my eyes. But I did wear this one to a movie and it was intact when the movie ended even though I cried a little. So I give it full marks for being water proof. It does stay for a very long time. I almost wore it all day long when I was at my in-laws place and people from the neighbourhood used to flock in the evenings to meet the new bride. This eyeliner did not cause any irritation when I applied for long time abd neither did it turn my eyelids black after I removed it. If you do not have a good make up remover, it might cling to your skin and darken it. So you need to take care of that. I conducted a waterproof test for you which you can see below. This is how it looked closely on my eyes. 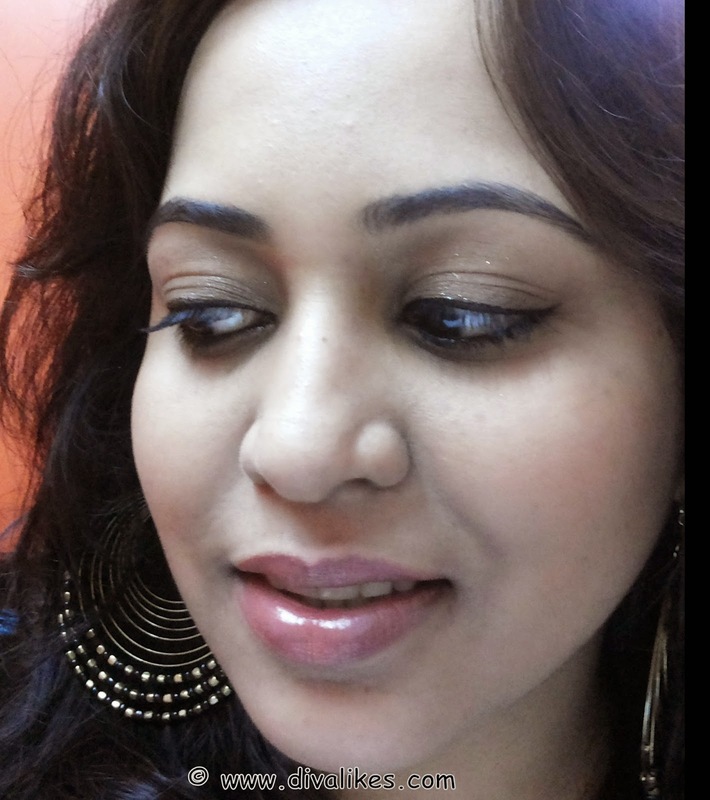 The final click is just to show the finished look which you get after using the eyeliner. It definitely highlights the beauty of entire face. This is a must try eyeliner if you are looking for a quality product. It did impart a little magic to my eyes with that dark black pigmentation and I love it a lot. 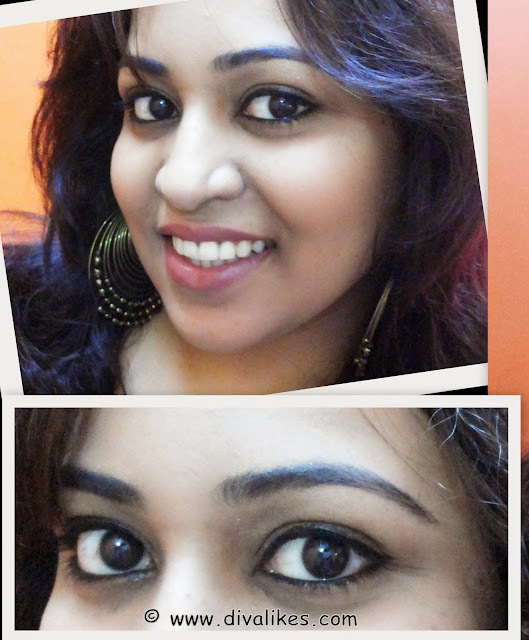 It does enhance ur beauty..
@Garima .. thanks a lot :) .. 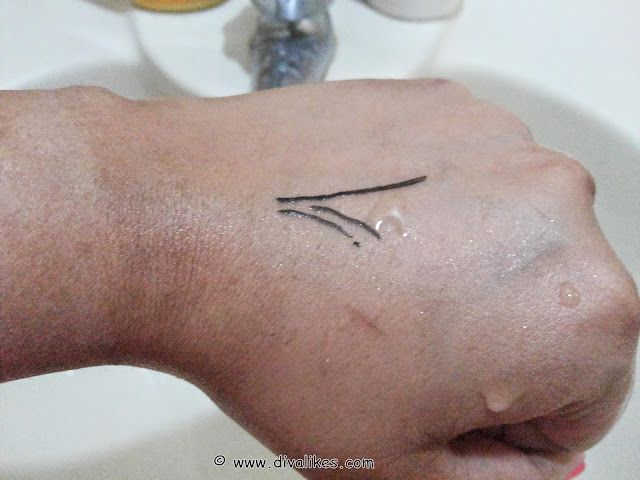 I have started using eyeliner since my Grad days.. so I guess got a stable hand while applying it!